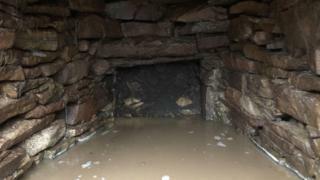 The Iron Age souterrain was revealed during the digging of the foundations for the property in Ness. Local archaeologists, husband and wife team Chris and Rachel Barrowman, are recording the souterrain. Dr Barrowman said theories on the purpose of the stone-lined, flat stone-roofed structures included storing food. He told BBC Radio's Good Morning Scotland programme: "They are usually associated with what are known as Atlantic roundhouses, or wheelhouses, of the later Iron Age. "If this one was associated with a roundhouse it is likely to have been cleared away by now." Dr Barrowman, who was asked to check the site by the contractor building the house using equipment from Comunn Eachdraidh Nis (Ness Historical Society), said the souterrain was well preserved. The archaeologist said he understood it to be the sixth to be recorded in the area. Comhairle nan Eilean Siar's regional archaeologist is expected to liaise with the islander building the house on what happens next. Dr Barrowman said it was likely that, following a full examination and recording of the site, the souterrain would be filled in and covered over to preserve the archaeology and then the construction of the new home would continue as planned.